Koneru Lakshmaiah Education Foundation is an educational institute in the Guntur District of Indian state Andhra Pradesh. The institute was initially known as KL University is one the reputed institute catering education in the various fields including engineering and technology. KL University is a deemed to be university conducting its own entrance examination in the name KLUEEE to substantiate the eligibility criteria of the candidates to seek admission in their reputed institution. 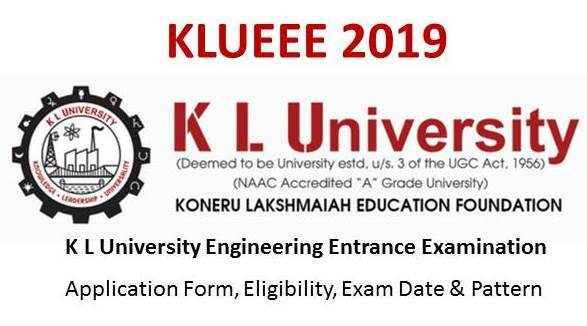 KLUEEE abbreviated as Koneru Lakshmaiah University Engineering Entrance Exam is conducted once in a year in the month of April. The details regarding the entrance exam is provided in the below mentioned article. KLUEEE 2019 is considered to be highly important for the aspirants willing to seek admission at KL University. In the below mentioned table, details regarding release of application form, admit card, exam, result, counseling and many such are mentioned for the students reference. KL University’s admission authorities have set certain eligibility criteria for the candidates willing to appear for KLUEEE 2019. The eligibility criteria are mandatory and if any candidates fail to meet the criteria will not be allowed to appear for the exam. Age: To appear for KLUEEE 2019 candidate’s age should not be below 16 or above 23 years. Nationality: Candidates should be an Indian for appearing in KLUEEE 2019. Qualification: Candidates should have completed or appearing 12th/intermediate from a recognized board can appear for admission. Subject & Score: Candidates should attain minimum 60% aggregate in 12th in Physics, Chemistry and Mathematics/Biology. KL University’s admission authorities will release KLUEEE 2019 application for through online and offline mode. Visit KLUEEE official website and navigate to new registration. Provide the required accurate details and upload the scanned documents. Click on submit option and make the payment online. Take the print out of the duly filled application form for further use. Payment for online application can be made through net banking/credit card/debit card. Payment for the offline application can be made through demand draft addressed to The Director, Admissions, KL University, 29-36-38, Museum Road, Governorpet,VIJAYAWADA - 520 002. KL University has designed the exam pattern for KLUEEE 2019 considering the syllabus of class 11th and 12th. Exam pattern consists of mode of exam, number of questions, etc., to guide the candidates to attempt the paper with familiarity and ease. Mode of Exam: KLUEEE 2019 will be conducted in both online and offline mode. Candidates can opt for computer based test and pen paper based test. Medium of Exam: KLUEEE 2019 will be conducted in English medium. Duration: Entrance exam for KL University will be conducted for 3 hours, i.e., 180 minutes. Exam Format: KLUEEE 2019 exam paper will consist of multiple choice questions. Each question will be provided with 4 options, out of which aspirants will have to choose the correct answer. Subjects: KLUEEE 2019 exam paper will consist of 3 subjects, namely Physics, Chemistry and Mathematics/Biology depending on the chosen course. Marking Scheme: in KLUEEE 2019, every correct answer will fetch +1 mark and no marks will be deducted for wrong answer or unanswered questions.? KLUEEE 2019 syllabus is been planned according to the topics and the chapters covered in the class 11th and 12th. The exam syllabus consists of 4 subjects, namely, Physics, Chemistry, Mathematics and Biology. Below mentioned are some of the topics students need to prepare before appearing for the exam. Physics: Units and dimensions, Elements of vectors, Kinematics-Dynamics, Work, Power, and Energy, Centre of Mass, Friction, Rotatory Motion, Gravitation, Simple Harmonic motion, Elasticity, Surface Tension, Hydrodynamics, Viscosity, Expansion of Solids- Liquids-Gases, Thermodynamics, thermal radiations, Sound, geometrical optics, Magnetism, Electrostatics, Current Electricity, Thermo Electricity, Electro Magnetics, Atomic Physics, Nuclear Physics, Semiconductor Devices. Chemistry: Atomic structure, Nuclear Chemistry, Periodic Classification of Elements, Chemical Bonding, Stoichiometry, Gaseous state, Solutions, Acid and Bases, Electrochemistry, Chemical Equilibrium and chemical kinetics, Chemical energetics, Surface chemistry, Hydrogen and its compound, Alkali and Alkaline Earth Metals, Group elements, IV Group elements, V Group Elements, VI Group Elements, VII Group Elements, Noble gases, transition elements (d - Block), Environmental Chemistry, Hydrocarbons-I (Alkanes and Alkenes), Hydrocarbons-II, Alkyl Halides, Alcohols, Ethers, Aldehydes and Ketones, Carboxylic Acids, Nitrogen Compounds, Chemistry in Biology and Medicine. Biology: Botany-World of plant life, Institutes and Botanists of India, Vegetative Morphology, Reproductive Morphology, Classification of Flowering Plants, Economic Botany, Cell Biology, Internal Organization of Plants, Biotechnology, Plant Kingdom, Microbiology, Plant Pathology, Plants and Environment, Crop Improvement, Plant physiology. - Zoology, the Basics, Characters and Classification of Invertebrate Phyla up to the Level of Classes with Examples, Animal Organization , Locomotion and Reproduction in Protozoa, Animal Associations, Phylum, Phylum-Arthropod, Man and Biosphere, Phylum-Chordate, Functional anatomy of Rabbit-Digestive, Respiratory and Circulatory systems, Functional Anatomy of rabbit-Excretory, Musculoskeletal and Reproductive Systems, Genetics, Organic Evolution, Applied Zoology. Admit card is an important document to be carried to KLUEEE 2019. Admit card will be available through online mode from the official website. The admit card will be available only for the registered candidates which has to be downloaded within the allotted time. Visit KLUEEE official website and navigate to Admit Card link. Provide KLUEEE 2019 application number and click on submit. Once the admit cad is display download and take a print out. KLUEEE 2019 results will be declared by the admission authorities of the KL University. The result will be declared through online mode from its official website. Admission at KL University will be based on the counseling of the score obtained by the candidate. Visit KLUEEE official website and navigate to Result link. Provide the KLUEEE 2019 application number and click on submit. Once the result is displayed take the print of the score card. The counseling process and seat allotment will be conducted under the admission authorities of KL University. Candidates will be called for counseling by sending counseling call letter by the university. Counseling [process will be done in person and the candidates should be physically present at the venue. Recent 6, passport size photograph of the candidates. Koneru Lakshmaiah University has established its exam centers for conducted KLUEEE 2019 in the various parts of the cities. Below mentioned are some of the cities where the university has established its both online exam centers and offline exam center. ICSS Computer Centre, Gandhi Nagar, Main road, Berhempur. Apoorva Women’s Degree College, Near Padmenayaka Kalyana Madapam, Mukarampura, Karimnagar, Telangana. DRS Degree College, Mamillagudem Street, Khammam Town, Khammam, Telangana. S S R Degree College, near Rajiv Gandhi Auditorium, Khalulwadi, Nizamabad, Telangana. Siddhartha Women’s Degree College, Opposite to BJP office, People nursing home Hospital, Kukatpally, Telangana. Siddhartha Degree &PG College, beside kupatpally bus stop, Kukatpally, Hyderabad, Telangana. Pragathi Women’s Degree college, C.C.N:1154, Vivekananda Nagar colony, Kukatpally, Telangana. Siddhartha Degree College, OPP.ICON Hospital, Dilsuk nagar, Telangana. Siddhartha Degree College for Women, Beside Kamala Hospital, Dilsukhnagar, Hyderabad, Telangana. Narayana Jr. College, 48-26-14, Akhila Arcade, Ramatalkies Road, Asilmetta, Vizag, Andhra Pradesh.